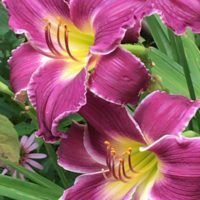 A customer favorite featuring gorgeous blooms and excellent performance. 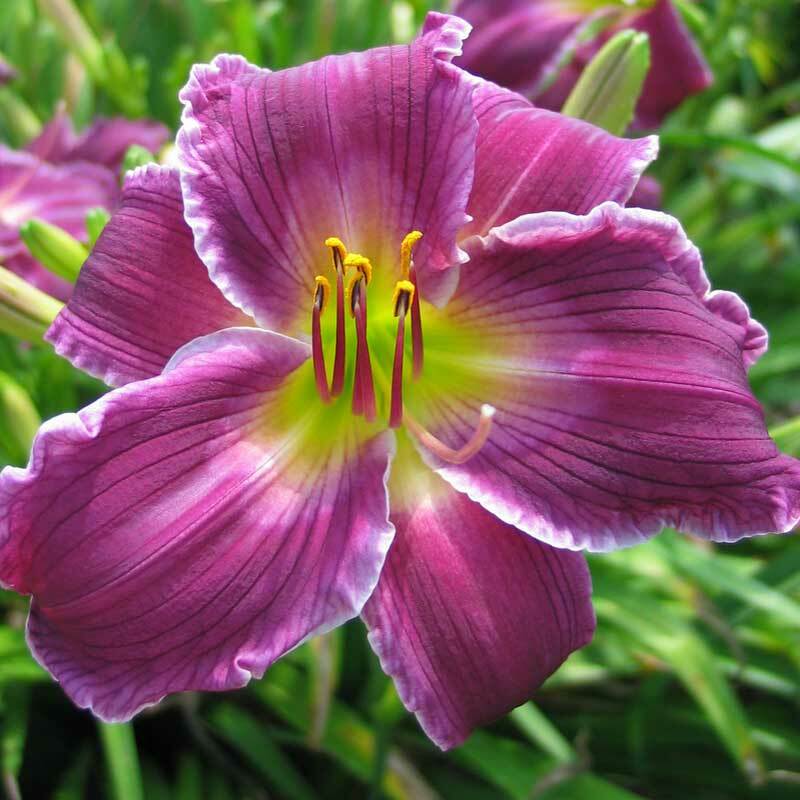 Deep purple blooms with a thin white edge, we get a spectacular first round of blooms and reliable rebloom. Indian Giver one of the best! I planted Indian Giver in the early fall of 2017 so this is it’s first full year in my garden. It produced masses of blooms this year plus one proliferation which I have planted. If that was not enough, it is now producing a second round of blooms. 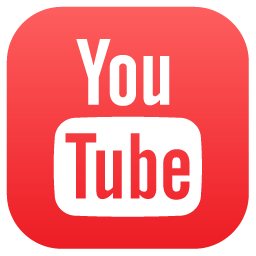 You gotta have this one!! 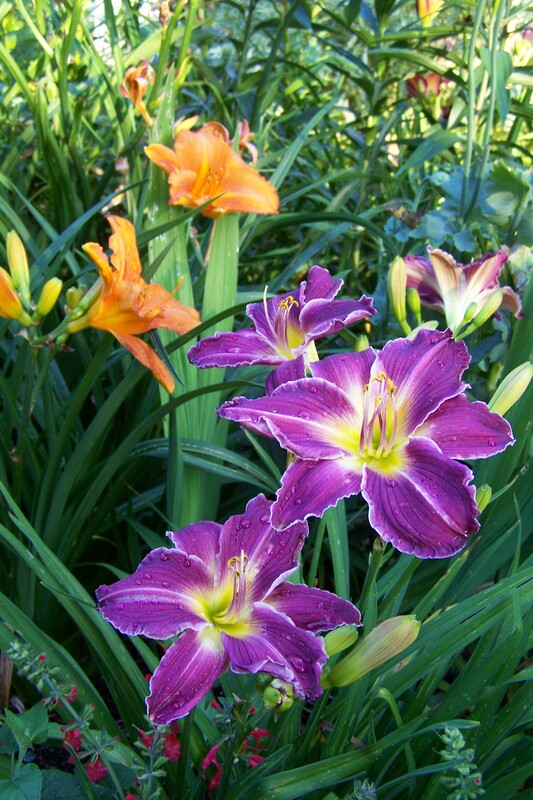 This is a great shorter purple daylily that grows well for me in iffy soil in my New Hampshire yard. I’ve had mine for 4 years and they have always bloomed well for me. The white edge gives it a lovely highlight. 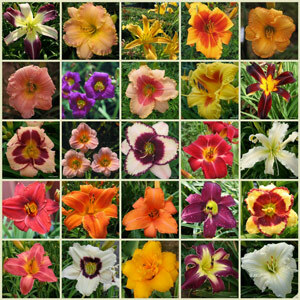 I have them planted near a Pocket Change daylily, and they complement each other so well since they bloom together for me. Beautiful color, beautiful bloom! Doing well in my garden here in Virginia! Strong bloomer. My neighbor just had to have a couple blooms for a vase on her bunco night. It’s that gorgeous. 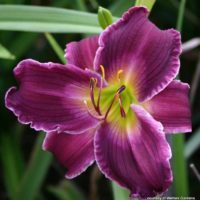 The colors of this daylily are remarkable: the loveliest shade of purple, tending towards the blue spectrum, are framed in distinct. Numerous blooms this year, in its first full summer in my garden. If you’re thinking it’s too expensive, take my word for it: ‘Indian Giver’ is worth every penny. Indian Giver keeps on giving! I bought two of these in 2017 and planted them in a whiskey barrel. They bloomed well the first season, but they are absolutely stunning this season, after only one year in my garden. If you don’t have this beauty, invest in it. You will reap dividends of beauty! I plan to put them in the ground this fall, paired with a couple of near whites. Such a beautiful flower. I just planted it two months ago and we’ve had some wild drastic weather – raining and 65 degrees, or hot hot and 90 degrees so I wasn’t expecting much, but I have 5 buds and 1 that bloomed two days ago that is breathtaking! So impressed and so happy! 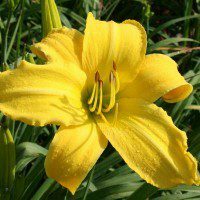 Last year I planted a different daylily and didn’t get half the results – so gorgeous! Nice powerful purple and beautiful white crimped edges! 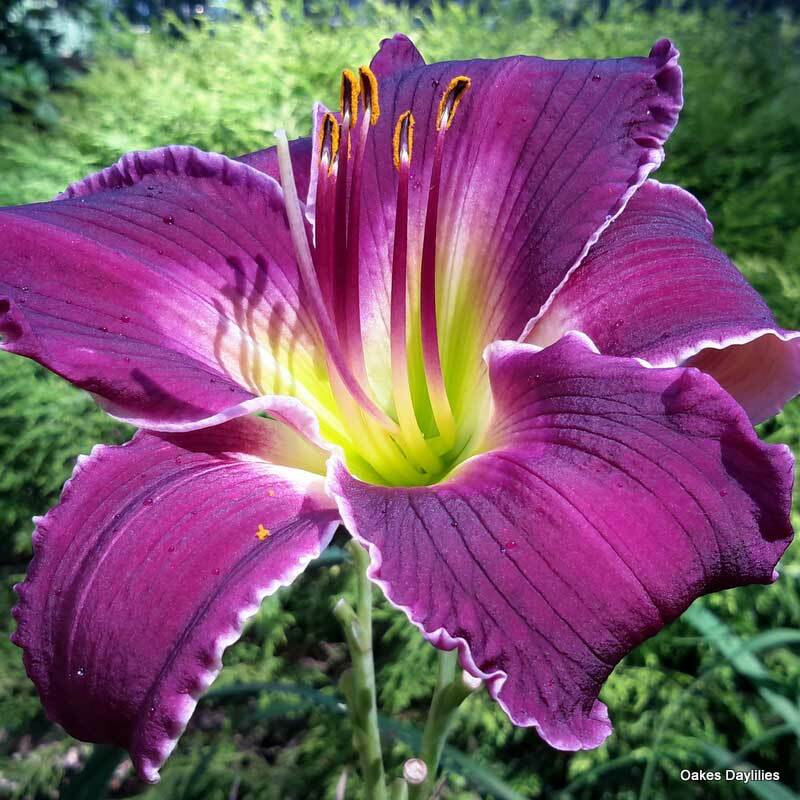 I have been super impressed with this daylily! Color is better than I could have imagined! Indian Giver is a deep, rich purple and the dainty white edge is a stunning contrast. Then you get the chartreuse green throat and it’s the whole package. We’ve had rain, rain, rain here in central Illinois this spring and Indian Giver doesn’t care a bit and is putting on quite a show. 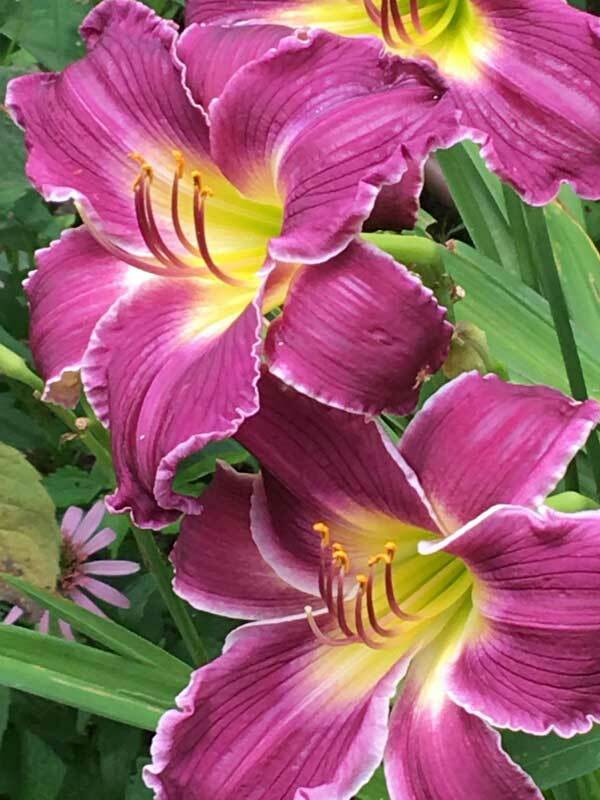 Indian Giver is breathtaking when in bloom. It is truly one of my favorites color wise. The purple is a true Amethyst color and stays true in the intense Midwest heat without fading. It was a bit slower to take off than some of the other varieties. 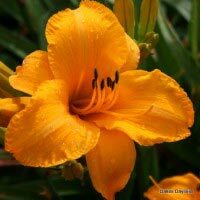 I had it in the garden for three seasons before I got more than just one or two blooms. 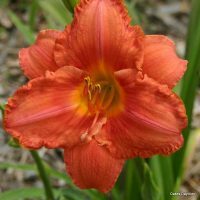 I’ve had Indian Giver a couple of years now and out of the 54 different daylilies in my garden, it was the best in 2013; loads of buds and it was the last one blooming. I’ve also divided it a few times. Oh, and it’s gorgeous! I have been so impressed with the performance of Indian Giver over the past two years that I have now created an entire bed just for them. The color is exactly like the picture and lasts all day, even during the hottest months of summer here in East Tennessee. The first blooming comes right on schedule with a rebloom that is just as spectacular. This one is a keeper for sure. The superstar in a border along my driveway, this prolific bloomer holds its pure purple color throughout the day. Truly a knockout. And I had a happy surprise this summer, finding a volunteer that sprouted and bloomed between two clumps of white day lilies. A gorgeous combination! This Indian Giver just keeps on giving. This is an absolutely stunning bloom. The white edging is amazing on every bloom. I have taken so many pictures of this plant–thank God for digital photography! Though I wish the blooms were larger, each one is a work of art. Mine receives afternoon shade, so it looks great all day long. Cornville,ME I purchased this one last year it was one of the smaller clumps that arrived from Oakes so I did not expect much the first year, but it was the first to send up a scape in fact two initially. The color in My Maine garden was closer to the purple/burgandy color of one of the photos here. It sent up another 3 scapes later in the summer here in my Centrial Maine garden with its short growing season. I was impressed with it’s performance. We will see how it handles our Maine Winters. Looking forward to next year it’s a definite keeper. INDIAN GIVER arrived in May and has had soggy feet for the last two months with very heavy rainfall in our zone. 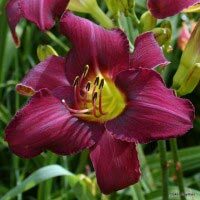 Today, July 5th, my first blooms opened and they are incredibly beautiful…deep vibrant color and soft edgings, just like the picture. 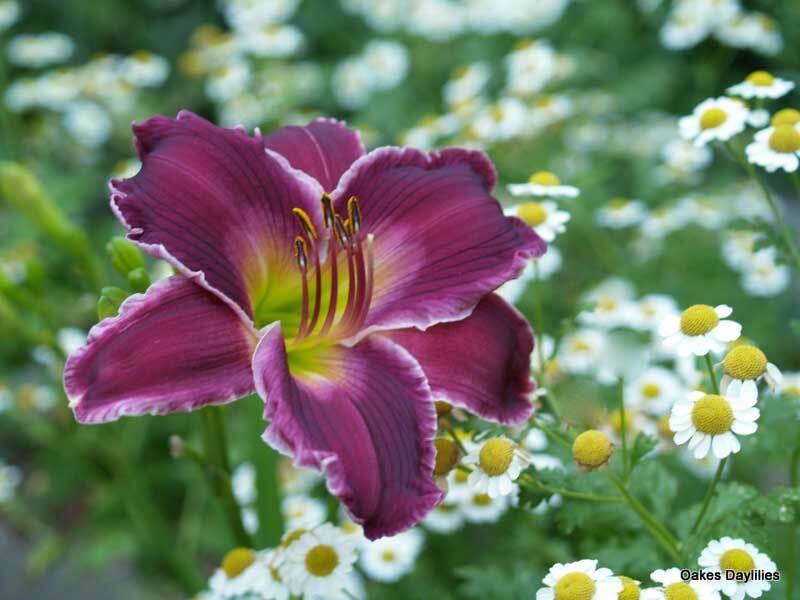 There is no doubt, you would enjoy this beauty placed prominently in your garden bed. I hope I don’t miss a single bloom. This is the most beautiful flower I have ever seen. The colors are unbelievable. The first year it didn’t do very well so the second year i put it in a pot and it did awesome. I bought three more for this season so hopefully they will do well the first year. They look really good near white callas and white and green caladiums. Fabulous bloom. Makes a big statement in the landscape. It was its first year, so not much rebloom. I’ll feed it better this year. The color held up well in the South and looked just like the photo. I’m ordering more. Indian Giver is one of the most unique colors that I have seen. Coupled with Pocket Change, Indian Giver will grab your attention the minute you arrive. Couldn’t ask for a better performance in the garden. One of the prettiest purples of all time! I love the size and color. The contrast of the lighter edges and the purple self are incredible!! !